Accu-Stats’ owner Pat Fleming had an idea. OK, economically, times are tough, he acknowledged. The “Industry” has been really supportive in its sponsorship-you know who you are-yet, what if the loyal Accu-Stats’ customer would assist in the production of a tournament? What if 100, A-S proven mail order buyers would contribute $300 to see the world’s best compete in a 6 man, round-robin event? What if you were to receive the complete HD DVD series of the event or, series of events, a VIP Seat in the Simonis Arena at Sandcastle Billiards in Edison, NJ – OR, an Internet pass, an ON AIR “Shout Out,” your name in the DVD credits, an autographed photo of the players, an “I Made it Happen” T-shirt, a copy of “Play Your Best 8-Ball” by Phil Capelle. and, lastly, you’d get to vote on which of the world’s best players gets invited? Would YOU Make it Happen? Do you know what? They did. 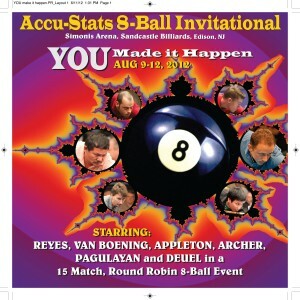 The commitments rolled in, the votes were counted, Efren, Shane, Darren, Johnny, Alex, and Corey were invited, The players, unanimously, agreed to appear and compete in the Accu-Stats 8-Ball Invitational, August 9-12, 2012. Simonis Arena, Sandcastle Billiards, Edison NJ. And, the “Make it Happen” series was borne. Look out for 1-Pocket, Straight Pool, and 10-Ball. And, they’ll all be televised: ESPN Star Sports has agreed to air the events in their footprint of 26 countries in Asia. Three N. Amercian networks have also expressed interest in the 8-Ball event. It’s not too late, YOU can still Make it Happen. More info at accu-stats.com or call Pat directly at 800.828.0397. Sponsorship enquiries? Call Medium Pool, 310.450.8525.